This Remembrance-themed concert marks the centenary of the Armistice, and forms part of a series of events marking Epworth Choir’s 60th anniversary year. The 200+ combined voices of Epworth Choir and Islington Choral Society are joined by the world-class Philharmonia Orchestra and a truly stellar line-up of vocal soloists. Internationally-acclaimed violinist Chloë Hanslip completes the line-up. The first half of the programme features Barber’s breathtaking Adagio for Strings, a solo performance by Chloë Hanslip, and the world premiere of a specially-commissioned orchestration of David Bednall’s powerful Nunc Dimittis. 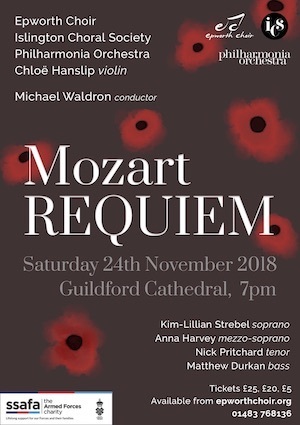 The second half of the programme culminates with the combined vocal and instrumental forces in what promises to be a truly uplifting performance of Mozart’s powerful Requiem.